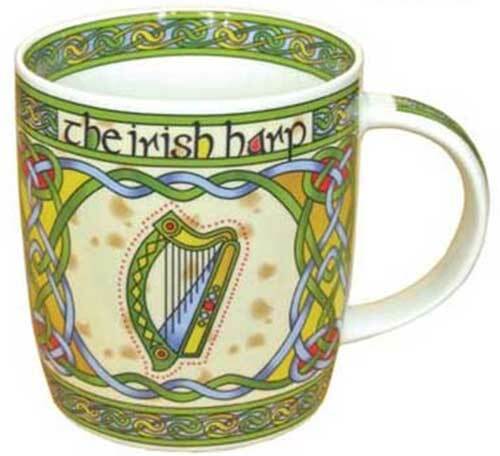 The harp coffee mug is enhanced with a Celtic knot motif. This coffee mug depicts an Irish harp in the style of 9th century ancient Celtic manuscripts which would have been painted by monks onto vellum or calf skin. This Irish coffee mug features a double sided design that depicts the harp along with a colorful Celtic motif that is repeated along the inside rim. 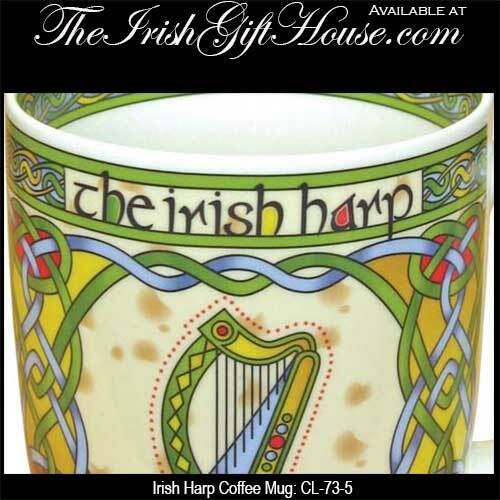 The Irish harp coffee mug holds 11 ounces of your favorite beverage and it stands 4" tall. The harp coffee cup is made of bone china and it is dishwasher and microwave oven safe. The Irish coffee cup is made in Ireland by Clara and it is gift boxed with a Celtic knot history card that is complements of The Irish Gift House. The Irish harp has many distinguishing features such as the sounding box is carved from a single block of willow wood along with a T-shaped fore-pillar, a heavy neck and thick brass strings. These combine to give the Irish harp a unique sound for which it has been famous since medieval times. Irish harpists also had a special playing skill and were much in demand among the ancient kings for entertainment.